Those in Annapolis probably want the losers section to be populated only with zebras, but you won’t find that in After Action’s first ever Winners and Losers. There were plenty of winners and losers in Navy’s unthinkable 18-point comeback that led to Air Force’s overtime victory. If you missed one of the top five service academy football games ever, check out the game stories filed by the two best respective Navy and Air Force football scribes Bill Wagner and Frank Schwab here and here. Everyone loves a winner and to be honest there were more winners than losers in this game so let’s start with those. Tim Jefferson – The first half might have been the best half of football of his career. He looked like former Nebraska great Tommie Frazier efficiently running the option while also showing off his arm as he diced up a Navy defense that looked flat in the first half. He got the Falcons to the line fast and left Navy’s defense gasping for air. Slowing the tempo down in the second half with the big lead let Navy’s defense catch their breath. Jefferson’s three-touchdown day — including his one-yard overtime score to win it — will likely be the game for which he will most be remembered. Brady Amack – Air Force’s senior linebacker recorded an unreal 23 tackles and tacked on two sacks. The 23 tackles tied a Mountain West record. He was all over the field trying to bottle up Navy’s option, which he and the defense were mostly successful until the epic fourth quarter. Alexander Teich – The burly Navy senior fullback rumbled all day over Air Force’s defense collecting 148 yards on 35 carries. He made the second-biggest play of the game scoring on the two-point coversion at the end of the game that capped Navy’s comeback to force overtime. Alex Means – Lost in all the debate over the 15-yard penalty is the fact Navy still got a chance to make the extra point. The kick didn’t fall short. It never got passed the line of scrimmage because the Air Force linebacker blocked it. Means also had 12 tackles and an interception. CBS – Execs in the CBS corner offices have to be thrilled they bumped this game to the national slot at noon. It delivered in every way imaginable. High scoring — check. Overtime, nail biter — check. Controversial call of water cooler discussion proportions — check. Can’t ask for much more at that at the noon time slot. I’ll be interested to see what rating that game received (some Big East officials probably have a similar curiosity). Academy recruiting – Air Force and Navy’s football programs are earning the academies plenty of free national advertising in the form of their football teams. 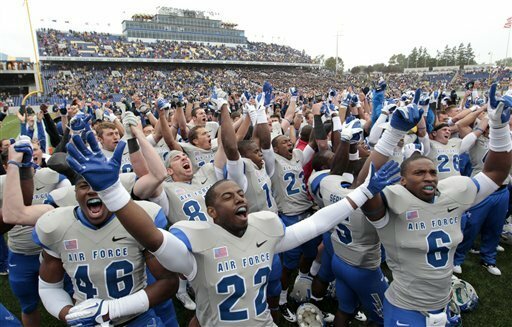 Air Force will play Notre Dame this Saturday for their second nationally televised game in a row. The show both teams put on in Annapolis this past Saturday will leave plenty of network executives looking to similarly bump both programs up. Kriss Proctor – I really wanted to put him in the winner’s bracket. But college football is a results-based business and his team left losers partly because a penalty he put the refs in a position to call. Like Jefferson, this was Proctor’s best game in a Navy uniform. He ran for three touchdowns and led Navy on an 18-point fourth quarter comeback. However, a boneheaded 15-yard unsportsmanlike penalty he got for getting in Air Force safety Jon Davis’ face after scoring the first touchdown in overtime hurt his team. Stop whining about the refs making the call. You put them in the position to make that call, whether it was the right one or not. Pat your teammates on the helmet. Hand the ball to the ref. And get ready to see if your defense can stop Air Force and win the game. The senior quarterback only has himself to blame after losing his poise at the most critical time. Ken Niumatalolo – It’s one thing for the players to complain after the game about the penalty, but the coach needs to show leadership and recognize that his quarterback put the referee in that position to make that call. Niumatalolo isn’t coaching a regular college football team. He’s coaching future leaders in the Navy who are going to experience some tough calls in their careers much like what happened Saturday. Complaining won’t cut it. They’ll be expected to perform and take responsibility for their mistakes or the mistakes of their sailors. Niumatalolo should have shown what it means to be a leader and left his complaints about the refs out of his post-game commentary. Ken Niumatalolo’s lei – We all get it. You’re from Hawaii. Leis are fine for the bowl games, but not appropriate attire for an Air Force-Navy game. Troy Calhoun was born in Oregon. He didn’t feel a need to honor the state’s legendary Tillamook cheese during the game. Navy field goal team – Why is everyone so focused on the referees for the loss? A 35-yard kick is not impossible at the college level. There are plenty of high school teams that can convert 35-yard field goals. Don’t place this loss at the ref’s feet. Navy’s line couldn’t block and its kicker Jon Teague couldn’t get enough altitude on a 35-yard kick to allude the Air Force linebacker’s hand. Back Judge David Vaughan – Sure I ripped the Navy team for crying over the unsportsmanlike penalty and not making the field goal but that doesn’t change the fact you CANNOT make that call in overtime of a heated rivalry such as Air Force-Navy. There’s too much on the line for any referee to throw that flag. Step in. Separate the players. And apply a warning. Don’t push the ball back 15 yards on a crucial extra point. Someone from this Big 12 crew needed to step in and apply some common sense and let the players decide this game. Commander-in-Chief’s Trophy’s travel budget – Unless Army can take some major steps forward this season in their program’s turnaround — which is not completely out of the question — the CIC trophy will be staying in Colorado Springs. Navy’s seven-year run of dominance is over. Looks like Tim Jefferson and the rest of the Falcons can schedule another trip to the White House.